Oh gosh, I didn’t realize he needed that much dental work – ouch! Good to hear that he’s doing well after it, though. Where did you end up going for it? Love the yarn, very pretty! Two root canals? Seriously? I had no idea little kids could ever need those. Wow. So are you switching dentists now? Glad to hear he came through everything all right and in good spirits! Yikes! Hope poor KnittyKid’s doing ok.
Poor guy! Sending good dental juju your way! 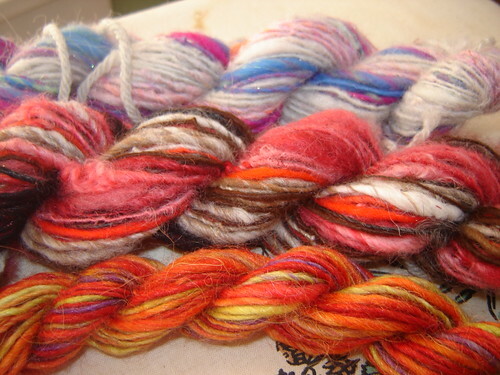 I love that middle skein especially – it looks like a yummy piece of candy. Hooray for speedy recoveries! Do children that age actually have that many teeth? Amazing that he needed so much work. Have you had a chat with your ped about this, btw? Go ahead and call me at midnight because I’ll be up. GC didn’t go to sleep last night until 1:30 😦 Beside, I deserve late night calls – what have I gotten us into????? Forgot to mention that I *LOVE* the skein on the bottom.